Plates fixate fractures of short bones or long (tub) bones, they are for corrections and bone stabilisation. Fixation of the plate on the bone is performed with the help of bone screws. With the help of self-compression screws, compression of fragments can be done without any other instruments using. The plate has on one or both sides compression holes - with the inclination up to 45°, during screwing of the screw, the bottom part of the spherical surface slides on sloping plane of the plate hole, and this way the fastened fragment of the bone shifts towards the fracture. The other screws get screwed in neutral position of holes until the final fixation is done. 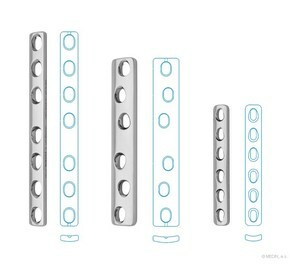 Bone plates are made of implant steel.